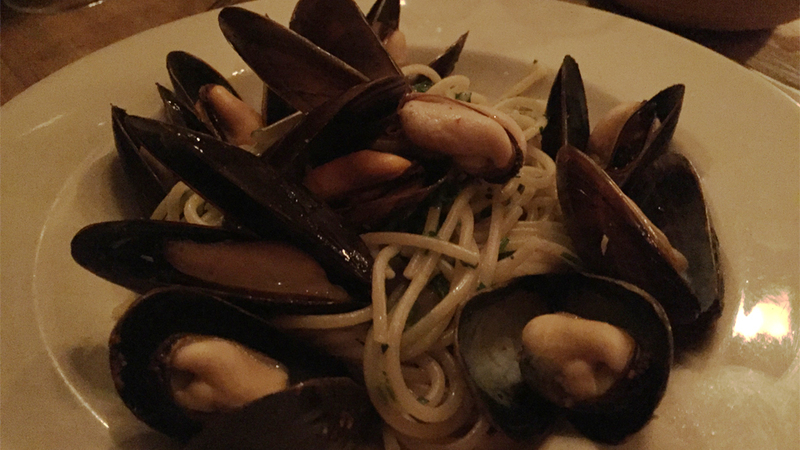 Spaghetti; spaghetti with mussels, olive oil, white wine, parsley and Calabrian chili. 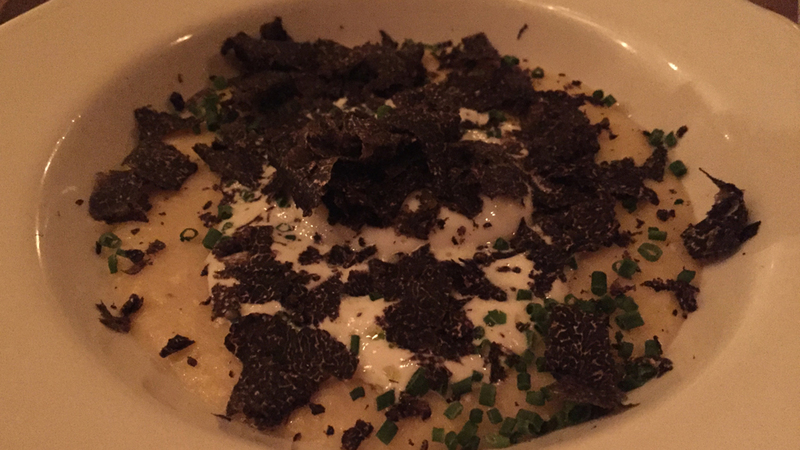 Polenta; polenta Bianca with Tartufo Nero and poached egg, with a Comté creme. 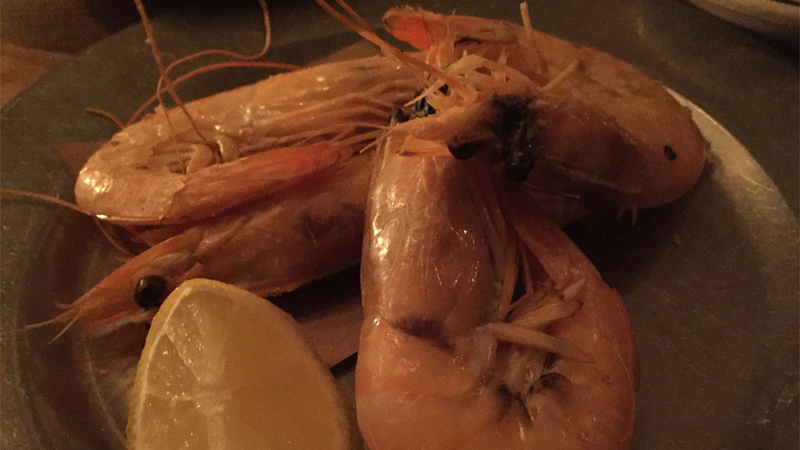 I have many knowledgeable food and wine loving friends in New York City who swear by Il Buco, so I was very happy to meet a few of them there recently for what turned out to be a wonderful dinner. Il Buco opened in 1994 as a rustic antique store on NoHo's Bond Street. Donna Lennard and her then partner, Alberto Avalle, used to invite their antiques customers to join them for a midday lunch. That eventually led to obtaining a wine and beer license and launching a restaurant that specializes in mainly Spanish and Italian cuisine-influenced fare. At Il Buco, high quality ingredients are sourced from local farmers as well as from the mother countries themselves. The decor is charmingly rustic, bursting with earth tones radiating a warm glow and contributing to the friendly, relaxing atmosphere. The wine list, created by Roberto Paris, is filled with smart, fairly-priced choices and has a welcome smattering of older vintages, which greatly increases the pleasure of having a meal at Il Buco. The presence of extremely competent and likable head sommelier Joe Robitaille or recently arrived sommelier Bryan Keller is another of Il Buco’s many keys to success, and in fact my friends and I had a great time our evening there. Spanish-born head chef Roberto Martinez trained in many upscale Spanish restaurants (such as Michelin three star restaurant, El Celler de Can Roca) and worked with a New York City great (David Bouley) prior to settling in at Il Buco. Obviously talented, his food, at once hearty and flavorful, is refined too, a neat trick. I always find it to be a very good sign when I finish all that is on my plate, yet find myself wishing I still had more of the same to eat, which is exactly what happens at Il Buco; and not because portions are small (they’re not) but because the food is just so delicious. In fact, I really can’t pick a standout dish on this particular night, as all were highly satisfying. I’ll just mention the different take on a classic, the Caesar salad, here sporting the crunchy wholesome taste given by black kale. Our night’s liquid libations were a worthy match of the fine food, with some bottles brought from personal wine cellars and others chosen off the wine list. We kicked things off in grand style, with the marvelous 2011 Bisson Spumante Metodo Classico Rosé Abissi. Another in a line of sparkling wines aged in marine grottos (in the manner of old Champagnes that are discovered in ancient sunken galeons from time to time) Bisson placed his bottles underwater in the bay of Portofino to determine how differently they might age and evolve over time compared to normally cellared bottles. I can’t tell you if the wines reflect much of a difference because of the two cellaring methods, but I will say that this sparkler is a beauty. It’s fresh, rich and ripe, but with noteworthy refinement to its chewy, saline red berry, sour red cherry and floral aromas and flavors. It’s a hard-to-find wine even in Italy, so I was impressed to find it on Il Buco’s list. Vinous readers know by now of my great love for German and Alsatian late harvest wines and any chance I have to share older bottles with good friends always makes me happy. I can’t say enough good things about the rare 1961 Hugel Gewürztraminer Beerenauslese, a wine made at a time when Alsace’s wine law legislating terms such as Vendanges Tardives and Sélection de Grains Nobles was still decades away. This explains the presence on this wine’s neck label of the Germanic term “beerenauslese”, instead of the “sélection de grains nobles” moniker that would have been used today. Actually, the wine’s main label carries a slew of other titles as well, including “sélection personnelle Jean Hugel”, “vendange tardive” and “auslese” (without the prefix “beeren”). It’s all enough to drive a man to drink; then again, given how absolutely marvelous this 1961 turned out to be, that wasn’t such a bad thing at all! Showcasing amazing sugar-acid balance, piercing but harmonious acidity and a rich but refined mouthfeel, the wine doesn’t even begin to hint at its age. Its remarkably straw-green hue, with barely a touch of aged gold to point you at least in the right direction, also makes the wine look far younger than it really is. In short, nobody that night would have guessed the wine to be almost sixty years old! Next up, a couple of Italian reds. Barolo lovers know that 1973 was anything but a good year in Langhe, so the ‘73s need to be approached with care, all the while hoping they were well stored. I can’t remember when the last time was that I had the 1973 Renato Ratti Barolo Marcenasco Abbazia dell’Annunziata, so I was looking forward to trying it on this night. Unfortunately, this bottle was lightly marred by cork taint, and so drawing any conclusions about the wine would be not just unfair, but impossible. I can’t say enough good things about Montevertine in Radda in Chianti, one of Italy’s truly iconic wine estates. I find the flagship wine, Le Pergole Torte, to be one of Italy’s very best reds, though I’ll admit the 1997 Montevertine Le Pergole Torte has never been one of my favorites. Yes, it’s impressive in its full-bodied, mouth-filling personality, but I find the creamy, ripe, roasted mouthfeel to be more typical of the hot year rather than that of the magical wine that Le Pergole Torte can be. It’s always a joy for me to taste German Rieslings from the 1970s, wines I essentially grew up on and still unabashedly love to this day. Clearly, the 1980s reeled off many more years of solid wines than the ‘70s ever did, but German Rieslings from 1971, 1975, and 1976 have left me with some of the greatest vinous memories I have. 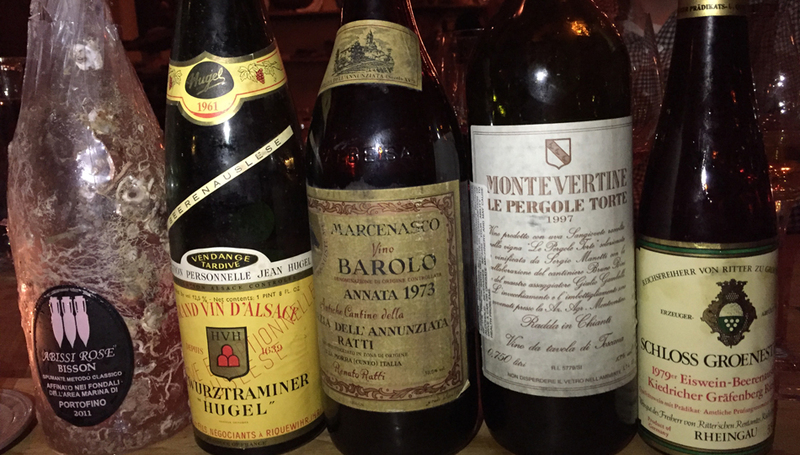 The underrated 1979 wines, though less concentrated and a touch softer than those of the other three better, vintages, have aged better than many experts initially thought. The 1979 Schloss Groenesteyn Kiedrich Grafenberg Riesling Eiswein-Beerenauslese is a case in point. Rich and ripe, with just barely enough acidity to keep it lively and interesting, this middle-aged beauty offers delicate noble rot undertones, a rich mouthfeel, lovely sugar-acid balance, and a long, pristine finish. Of course, the Eiswein-Beerenauslese category no longer exists (use of terms such as Auslese Eiswein and Beerenauslese Eiswein was disallowed with the new German wine law of 1981; from then on, wines made with frozen grapes were to be called Eiswein only); but this label offers a glimpse back to decades past, thereby adding to this wine’s many charms. For the joy of all those who are scientifically minded, the Schloss Groenesteyn estate is also known as Weingut Reichsfreiherr von Ritter zu Groenesteyn, and is located in the postcard-pretty Gothic town of Kiedrich, famous for, among other things, the oldest winemakers' co-operative in the Rheingau (established in 1893) but even more interestingly, for its festival celebrating wine and marriage, held every June. Sounds like the denizens of Kiedrich came up with the best possible dynamic duo there is (love and wine), long before Bob Kane and Bill Finger ever dreamt up Batman and Robin! Unfortunately, the next day was going to be a long and difficult one, with an early wake up call, one meeting after another and a flight out to Miami awaiting in the late afternoon, so I reluctantly had to call it a night much sooner than I would have liked. My friends of course stayed on, admirably determined to squeeze out every last drop from the bottles on the table. Stepping out into a very cold New York City winter’s night air, I couldn’t help but smile at the thought of men and women who have their priorities so wonderfully straight.